Most horses are over-fed, over-rugged, and under-exercised, the British Equine Veterinary Association says. Over-fed, over-rugged, and under-exercised. The growing obesity epidemic among Britain’s horses is causing growing concern, with the British Equine Veterinary Association (BEVA) urging owners to act now to prevent their horses suffering weight-related health and welfare risks come the arrival of spring growth. Some studies suggest that more than half of certain horse sectors in Britain are overweight or obese. 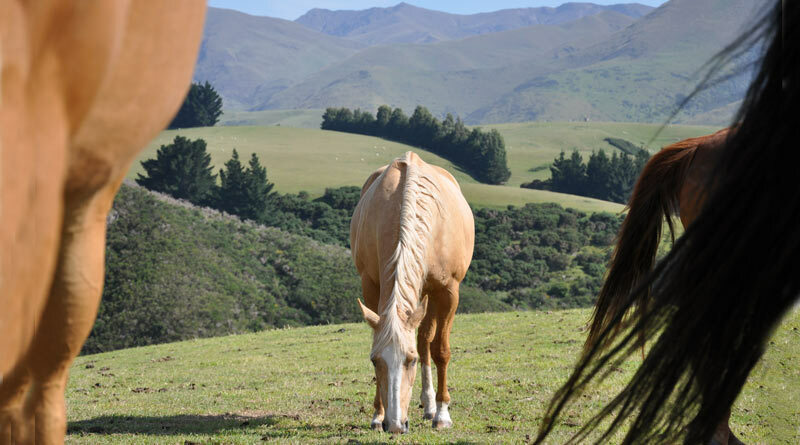 In today’s domesticated environment with greater access to forage, hard feed, stabling and rugs, horses and ponies can quickly pile on dangerous excess pounds. This increases the risk of dangerous diseases such as laminitis, as well as placing extra pressure on joints. An overweight horse or pony is compromised in its ability to perform any activity, competitive or otherwise. Equine obesity is not a new problem, but appears to be becoming more common. And it’s not just ponies and native breeds that are susceptible. Studies have identified high levels of obesity in leisure horses and unaffiliated competition horses, especially those competing in showing and dressage. “Not only are many horses being unintentionally over-fed, over-rugged, and under-exercised but, as perceptions of what constitutes a healthy weight have become distorted, overweight has become the norm,” says David Rendle, who serves on BEVA’s Health & Medicines Committee. Ocko, a 17-year-old severely overweight cob mare, developed laminitis in March 2018 and was close to being euthanised due to her discomfort. Ocko before her weight-loss plan. Joe Mackinder, Oko’s vet at Rainbow Equine Hospital, Yorkshire, diagnosed equine metabolic syndrome. He provided a low-sugar diet plan to help her lose weight safely and, because the horse was in such a bad way, he prescribed medication to hasten her weight loss and help her laminitis. “Through the remainder of the winter Ocko was clipped and only had a lightweight rug so she could lose weight during the colder weather as horses are supposed to,” Mackinder says. Ocko’s weight loss helped save her life. Ocko’s owner, Andrea Hetherington, said she would urge people to listen to their vet and stick to what they are asked to do. “It’s not an overnight recovery, it takes time and patience. “The changes made for Ocko are for life to ensure she stays as sound as possible. We now take pride in the fact we can see her ribs. We never realised how overweight she was and when we were warned she was gaining weight we made excuses. The chairwoman of BEVA’s Ethics & Welfare Committee, Lucy Grieve, continued: “There seems to be a stigma attached to having a ‘fit’ or lean horse on many livery yards when, in fact, such a horse is highly likely to be healthier than its overweight neighbour. “I can’t emphasise enough that prevention is better than cure. Avoiding weight gain is notoriously easier than trying to effect weight loss, so spotting that your horse is starting to put on weight is critical. BEVA is developing information and tools to help vets work with owners as a team to tackle equine obesity.